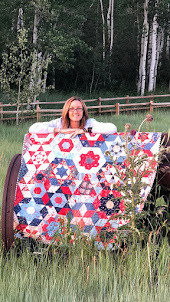 I was thrilled to be asked to join in Janice's and Jen's blog hop and make this sweet little mini quilt, the pattern is delightful. Choosing which tiny quilt to make for my project was alot of fun, I looked through all my patterns then decided to just make something simple and fun. I haven't had time to bind my quilt yet but as its an extra long weekend I can sit back and enjoy doing this at my leisure. Below is a list of all the other participants who are sharing their mini quilt today, please pop on over to their blogs and take a look. 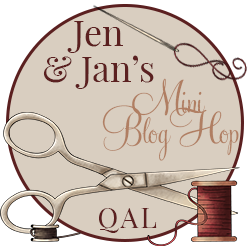 If you leave a comment on Jen and Janice's blog you go into the draw to win a prize so be sure to enter. What a sweet little project and I love the autumn leaves. Yay! Autumn at last. How cute! Looks like a fun bog hop. I'm off to do some hopping now! A very fun modern mini!! 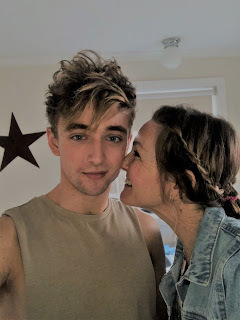 Your house is mod and adorable ! I'm loving all the variations of this pattern! I really like your version, and the way you put the bird in the middle of the roof. Your quilter is very feminine with the lovely mini quilt on the washing line. I especially like the border, it's lovely. this is so sweet. I love that for the picture you added the leaves. I love all the fun fabrics you chose for your mini! Adding the border was a great idea! So cute! So cute! Love the fussy cutting on the roof to get the little bird. I have to remark that your generous border in a larger print lends the whole piece a lot of energy. It picks up so well in your roof, and modernizes the piece nicely. Very nice work! Great job tying all the fabrics together - looks really great! So many beautiful fabrics in this and they all work so nice together. I especially love that pink road! And the roof too! Putting that border on just tied it all together. So cute! Thanks for joining us! Such bright colors! This quilt makes me smile it's so sweet. Love the little touches! Love that quilt on the line and that roof fabric. Very whimsical. This looks adorable in your sweet prints--and I love the scrappiness of the border. Adorable! I just love the fabrics you chose. Very cute and sweet! The bird on the roof is just perfect! Autumn there now. I never realized that seasons differed around the world. I learned something else new today. I love your pink sidewalk and the border addition is perfect; matches your sweet mini-mini on the line just to perfection! This is adorable! I love the prints that you chose, super cute!